China, the West and the Future of Global Capitalism - or Not? We hope you will enjoy the photo news below which will highlight some features of the conference and show some initial reflections. Your material and opinions are welcome and will be used to update this page from time to time. 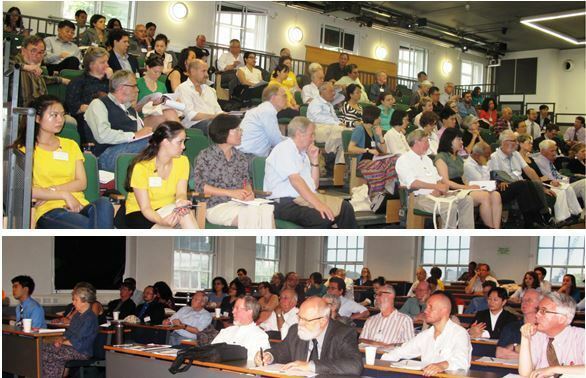 The two photos above show the conference plenary venues (G2: top) and (V211: bottom), SOAS. Dr Hong Bo (left), Reader in the Financial Economics Department of Financial & Management Studies at SOAS, University of London, chaired the Opening session; Professor Paul Webley (middle), SOAS Director, made welcoming remarks and introduced SOAS as the world's leading institution for the study of Asia, Africa and the Middle East; Professor Martin Albrow (right), Fellow of Kӓte Hamburger Centre for Advanced Study, University of Bonn, Germany and Honorary Vice-President, British Sociological Association (BSA), pointed out that we have joined together out of shared scholarly interest in the conference theme, not as part of a programme mandated by big associations or institutions, and expressed his gratitude to SOAS, to some Conference Programme Committee members and to everyone participating who played key roles in organising this conference for hosting and organising this conference. Although Professor Su Guoxun was absent from the conference for health reasons, his speech was delivered at the conference by Dr Xiaoying Zhang (Beijing Foreign Studies University, China). Su, the foremost Chinese expert on Weber from the Chinese Academy of Social Sciences and Harbin Engineering University, pointed out some of the misconceptions that led Weber to misinterpret certain elements of Chinese culture and sought to develop more refined methods of inter-civilizational analysis. The audience raised many critical and interested questions. Dr Xiangqun Chang (CCPN Global and SOAS), chair of the session, offered to convey all the criticisms, comments, questions and feedback to Professor Su and seek his responses and, it is hoped, to publish an ‘absent dialogue’ between a Chinese scholar and the Western Weberians in the conference special issue of the Journal of China in Comparative Perspective in 2014. 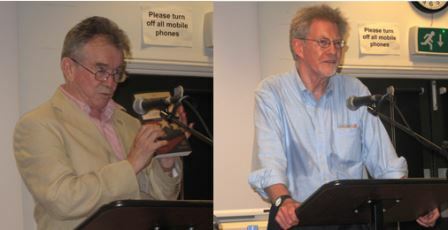 The left photo is Professor Martin Albrow who is holding a new edition of the Max Weber: The Protestant Ethic and the Spirit of Capitalism, translated and introduced by Stephen Kalberg (right), when introducing Professor Kalberg as Keynote speaker from Boston University, USA. Kalberg argues for the continued relevance of Weber’s systemic approach to the comparative analysis of civilizations. He made a critical reappraisal of Weberian theory and its contemporary relevance, which can be seen from his book Max Weber's Comparative-Historical Sociology (2012). Many interesting questions were raised by the audience. The last Keynote speaker was Professor Gary Hamilton (left below), University of Washington, USA. Professor Wolfgang Schluchter (right) chaired this session. He acknowledged two things that he learned from Hamilton on studies of Weber. One is that Hamilton’s work on family based capitalism in Asia reveals to him that Weber’s insistence that capitalism requires a separation between firms and families was not accurate for Asia. Another is that he agreed that Weber made a mistake equating patria potestas and xiao (孝) in his comparison of traditional Chinese and Roman societies. When Schluchter mentioned this he shown the newly published From the Soil --– the foundation of Chinese society (Xiangtu Zhongguo), Chinese-English edition, by Fei Xiaotong and translated by Gary Hamilton and Zheng Wang (second right in next set of photos). The editor of the Chinese-English edition of From the Soil is the same person who organised a dialogue between Gary Hamilton and Xiangqun Chang on Fei’s contributions to world anthropology and global sociology for commemorating the centenary of Professor Fei Xiaotong’s birth in 2010. The abridged version is published in Anthropology Today, No.6, 2011 (the first and second photos on the left). The completed version will be available in print in Journal of China in Comparative Perspective (JCCP), 1(2), 2011. 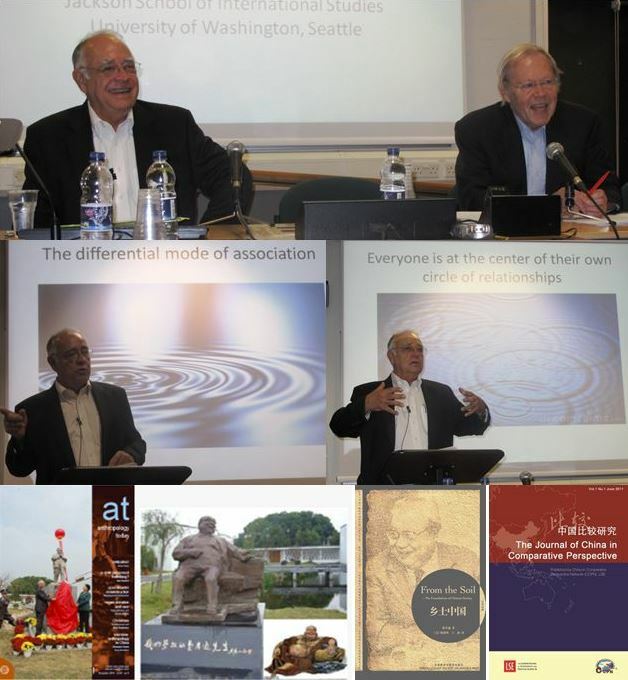 In his presentation Hamilton showed pictures of a single and multiple ripples in a pond to demonstrate chaxugeju as ‘the differential mode of association’ and ‘everyone is the centre of their own circle of relationships’. In his earlier paper he put his corrections on Weber’s view between xiao and patria potestas by using Fei Xiaotong’ concepts chaxugeju (差序格局) and tuantugeju (团 体格局) into a larger framework which is published in the first ever issue (1(1), 2011, JCCP, right). All the major articles in this issue of JCCP are related to Fei’s From the Soil. It was published in Chinese in 1947 and the English version became available in 1992, but it is still relevant today because many important late generations of Chinese scholars’ work has been built on it. Even Hamilton, translator of the book, had overlooked and did not fully appreciate some major points made by Fei Xiaotong in this book (Chang, 2011，1(1):32, JCCP). A more substantial work on chaxugeju by Stephan Feuchtwang is entitled ‘Social egoism and individualism: Surprises and questions from a Western anthropologist of China – Reading Professor Fei Xiaotong’s contrast between China and the West’. It was written 15 years after the English version From the Soil was published which will be available in the 1(2), 2011, JCCP. (Note: the website and email address on the back cover are no longer operating from March and July 2013 respectively. 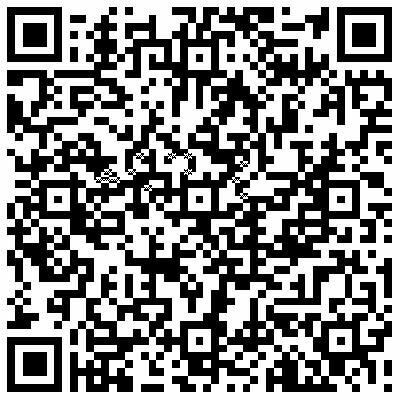 The current email is: journal@ccpn-global.org; website: www.journal.ccpn-global.org). After the conference, Hamilton said that ‘the conference made me aware about how much remains to be done to build a framework for the comparative study of China’. There were three joint plenary sessions. Dr Athena Leoussi, Co-Director of European Studies, University of Reading, UK, chaired the first joint plenary session. Athar Hussain, Professor and Director of the Asia Research Centre, at the London School of Economics and Political Science (LSE), UK, showed how examination selection in Chinese schools favoured the well-established who could afford to give their children extra coaching for a marking scheme that ranked students; this worked against the children of the poor and the internal migrant. Professor Sam Whimster, Editor of Max Weber Studies, gave a presentation of Weberian social-economics arguing that Weber’s typology had to be unpacked and applied to case studies. Weber did this for Russia in 1906, we have to do this for China today. He suggested that Weber’s key concepts, such as economic power, the legal power of disposition, appropriation, the forms of the division of labour, the forms of organization, the nation and its state, and societalization, can be used to analyse Chinese economic development over the last decades in its own terms, and not judged against a normative model of what proper capitalism should be. The second joint plenary session was chaired by Dr Peter Flügel (middle), Reader in the Study of Religions at the Department of the Study of Religions, SOAS, UK. Bryna Goodman (right), Professor of History and Director of Asian Studies, University of Oregon, USA, gave a talk entitled ‘Not a Club for Ethical Culture’: Politics, Law and Capitalism in Early Chinese Stock Exchanges Selection’. Using the 1921 Shanghai stock exchange bubble as a case study she ‘examines a public controversy over these issues in the form of a public debate between individual businessmen and the Shanghai Chamber of Commerce over issues of economic development, freedom, and national sovereignty’. This mirrored the issues raised by Weber’s own defence of the stock exchanges in the Kaiserreich in the 1890s. Afterwards, Karen Turner (left), Professor of History and Research Scholar, College of the Holy Cross at the Harvard Law School, EALS, USA, talked about ‘Religion in the service of the state: A Reassessment of Weber’s view of the Chinese tradition’. She ‘analyzed how excavated texts and revisionist views of transmitted texts reveal that a high level of formal rationality shaped the Chinese bureaucracy in the formative era of the imperial state’, and demonstrated that the Chinese, much earlier than in the West, developed an efficient blueprint, sanctioned by sacred texts, for managing the economy to serve the state’. In her remarks she observed that Confucian officials were mostly self-serving and not prepared to make sacrifices for fundamental change. The third joint plenary session was chaired by Dr Carlos Frade (left), Senior Lecturer in Sociology, University of Salford and Chair of the Weber Studies Group, British Sociological Association (BSA), UK. This session combined two co-presenters each. Judith Farquhar (right), Max Palevsky Professor of Anthropology, Department of Anthropology, University of Chicago, USA, presented a joint paper with Dr Lili Lai (middle), Senior Lecturer, Medical Humanities Institute, Health Sciences Centre, Peking University, China, entitled ‘National Medicines in China: Institutional Rationality and Healing Charisma’. From their empirical studies they found that ‘being social, no regime can ever be purely “rational”’ because ‘rational systems of medical information cannot, in the end, be external to medical art or “healing charisma”’. They sought to show that the rational and the non-rational have a co-constitutive relationship, not just in theory, but in historical practice in China’. This paper prompted many questions. Wolfgang Schluchter suggested that ‘charisma’ was a political concept that presupposed a personal relationship of leader and follower. Against this the speakers referred to the magical- charismatic practices as described by Stephan Feuchtwang and Mingming Wang (Grassroots charisma: four local leaders in China, 2001). Both cases are examples of how Weber’s ‘Charisma’ can be used in either a real term or in ‘imaginative way’ by empirical studies in China. It seems there are two views on charisma. This illustrated a tendency in the conference for papers that sought a strict application to the Chinese context, and those that favoured a more imaginative use of Weberian concepts when faced with that same context? The last joint plenary session was presented jointly by Professor Martin Albrow (right) and Dr Xiaoying Zhang (left), Associate Professor and Head of Journalism Department, Vice Dean of School of English and International Studies, Beijing Foreign Studies University, China. The title is ‘World beyond worlds: Max Weber, China and the ‘impartial spectator’. This presentation was a kind of dialogue: Albrow explained how the ideas of ‘world’ have a central place in Max Weber’s comparative studies of religion. Zhang introduced the Chinese view of the world (Shijie 世界and Tianxia天 下). Other thinkers like John Dewey and Bertrand Russell who had both lived and taught in China and thus also appreciated a different world from the West. They provided ‘a shared account of a different world as a better alternative to discarding the idea of the world altogether’. As the author of the Global Age, Albrow turned his attention to ‘world’ as can be seen from the book series ‘Chinese Thoughts for a New World Order -- A Series of Works in English by Chinese Scholars in Humanities and Social Sciences in comparative perspective’ that he proposed and that was funded by the Social Sciences Academic Press (SSAP), China. One of the books that was mentioned by Zhang in her talk is ‘Global System’ by Tingyang Zhao’ which provides a Chinese perspective on the world-system. The conference received nearly 50 paper submissions including joint authors (as can be seen from the book of abstracts). Apart from the plenary speeches and absent paper givers the rest of the 30 papers were divided into 10 streams. They are: Re-Reading Weber, On Rationalization in Weber, Confucianism and the Work Ethic, Law in China, Chinese Law in Comparative Perspective, Modernity and the Rise of China, Revisiting Weber on the Modern Chinese Economy, The Chinese State and Market Socialism, Chinese Enterprise, and Chinese Investment. The above photos are randomly selected streams. 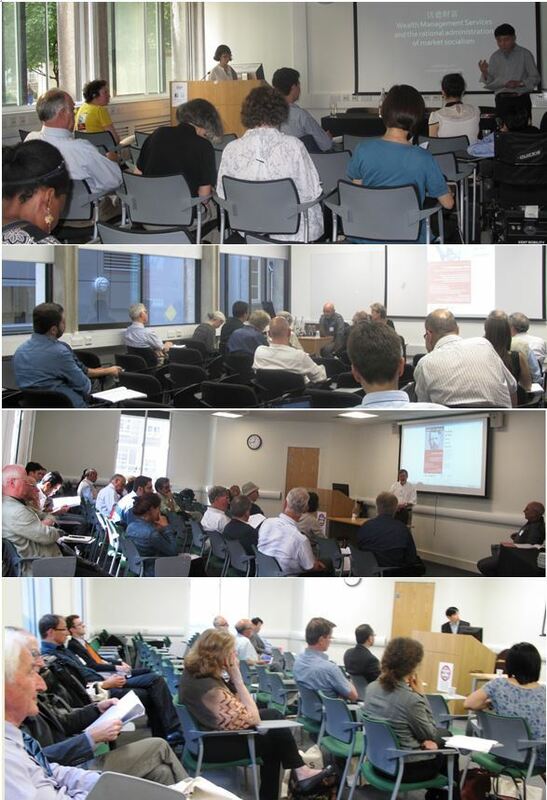 The top photo shows Dr Kent Deng, Reader in Economic History, LSE, UK, who was chairing one of the streams. 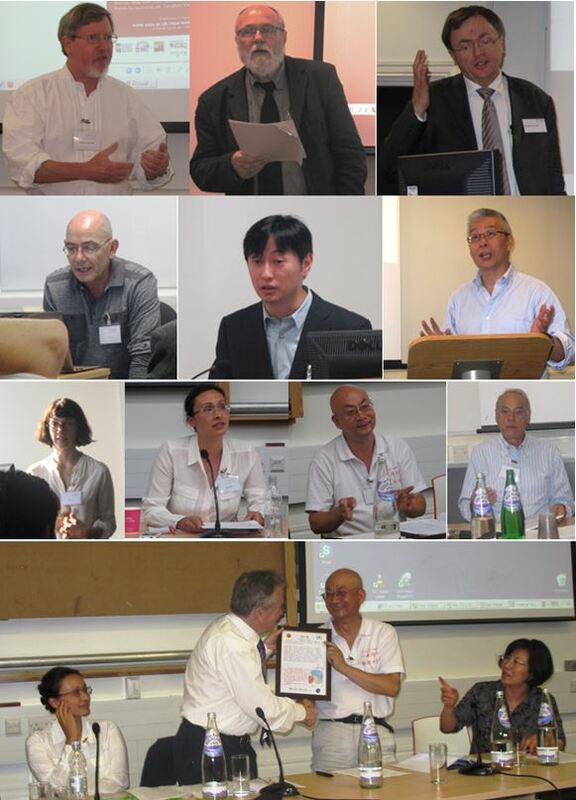 The above photos are a small selection of various panellists presenting their papers in different streams. One interesting presentation was given by Professor Hong Qian, Director of the Institution for Global Symbiosis, China, entitled ‘Weber’s Capitalist Spirit and the Symbiosis Values’. Qian made a comparison between Karl Marx and Max Weber and believes the former used ‘the critical weapon’ and ‘weapons of criticism’ to examine capitalism; whereas the latter, Weber, discussed the internal relationship between the protestant ethic and the spirit of capitalism. He then made a simple comparison between capitalist and socialist societies. He pointed out that ‘capitalism encountered the limits of its self-development, antagonism and being treated negatively. As a result, when dealing with the relations between human beings and nature, humans and humans, and humans and themselves, the protestant ethic and Weber’s capitalism spirit encountered a great predicament,’ whereas socialism in China appeared as ‘state capitalism’. He concluded that ‘either socializing capitalism or capitalizing socialism’ won’t work. Based on his research and experience, the integration of ancient oriental wisdom and contemporary biological symbiogenesis findings, Qian proposed a Chinese philosophical idea of ‘symbiotic values’ in the context of global ecology. It can be simply expressed as ‘live and let live’. 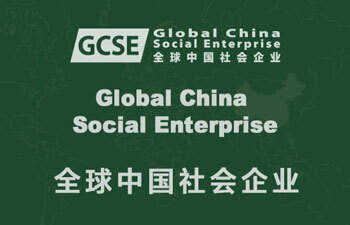 This idea has been acknowledged by the new generation of leaders in China. He suggested that it can be used as a principle to deal with the three major relationships in the world: man and nature, man and man, man and himself. In order to implement the ‘symbiotic values’ Qian proposed ‘A DECALOGUE by SYMBIOSIS’ with 333 Chinese characters. The photo at the bottom shows Qian presenting this as a gift to the stream chair Professor Martin Albrow after his presentation. After each speech or presentation at either plenary or stream there are always Q & A sessions. They are equally important. 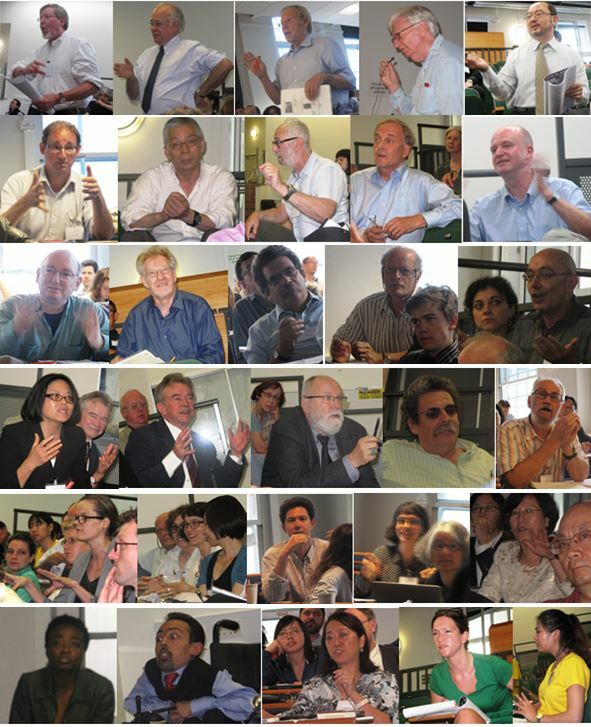 The many photos show enthusiastic audience participants in the conference throughout. It was their efforts together with the speakers who made the conference so intellectually stimulating. 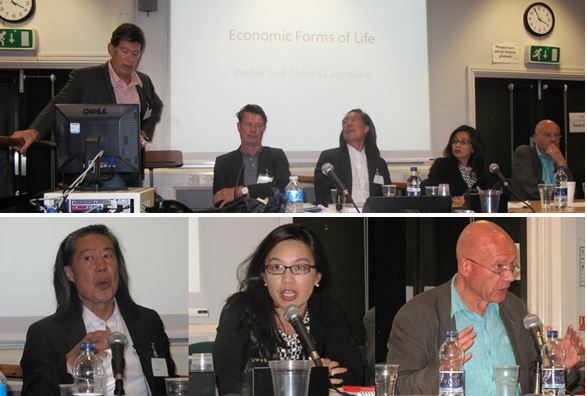 The closing session started with a plenary panel entitled ‘The Future of Capitalism’. It was organised and chaired by Professor Sam Whimster from the Global Policy Institute. Scott Lash, Professor of Sociology and Director of Centre for Cultural Studies at Goldsmiths, London, presented arguments from his new book China Constructing Capitalism: Economic Life and Urban Change, of which he is co-author. China is either regarded as falling short of western business standards, e.g. property and contract law, or is seen as hell-bent on its own version of neo-liberalism. Instead Lash argued that while neo-liberal economic life is individualized and disembedded the China model is relational and situated. Also, its vast urban change has to be seen as a new form of ‘local state capitalism’. Weber’s instrumental rationality has to be reconceptualiszed as a new type of substantive rationality, an argument extending to ethics. The question to the panel then became whether China represents a divergent model of capitalism. Stephen Chan (OBE), Professor of International Relations at SOAS and editor of The Morality of China in Africa: The Middle Kingdom and the Dark Continent, said that China placed great store on essential features of the global order: the Westphalian notion of the sovereignty of the state, and its membership of the WTO. On matters of trade with Africa, Chinese officials applied an extremely hard-headed cost-benefit analysis of their objectives. Ann Lee, adjunct professor of economics and finance at NYU and author of What the U.S. Can Learn from China took a more convergent view, noting that China in its vigorous new initiatives did not suffer from the dysfunctionality of the current US. Martin Jacques, author of the controversial best-seller When China Rules the World: the End of the Western World and the Birth of a New Global Order, argued that on present trends China will soon become the dominant global power; for example, just how long do we expect the international ascendancy of the US dollar to last? It then becomes fanciful to suppose that China will abide by a model and rules established in the West. The recent financial crisis, still unresolved, shows both the weakness of the West and the need for new departures, and indeed as Martin Albrow noted: are we not entering a universalised information age? The extensive and lively Q&A session recalled Max Weber’s own stipulations on the rationality structures required for a successful modernity and that the dynamic of capitalism is marked by inherent tensions and dangers. Finally, there was a small session for Closing Remarks. It was chaired by Mr Ernest Caldwell (left), Lecturer in Chinese Law, SOAS. Professor Stephen Chan (middle) represented SOAS to thank everybody whose participation in different ways made a great success of the conference. It reminded him of the first time when he read Max Weber in 1973 and how much more understanding he gained and how helpful it has been with his research over the past four decades. Dr Xiangqun Chang (right), Co-Director of CCPN Global and Research Associate of Centre for Chinese Studies, SOAS, University of London, UK, made a long list of thanks to all the people who helped the conference directly, indirectly, physically, spiritually, intellectually, financially, and so on. Xiangqun quoted a Chinese saying ‘when we drink water from the well, we shall never forget the person who digs the well’ (吃水不忘挖井人). 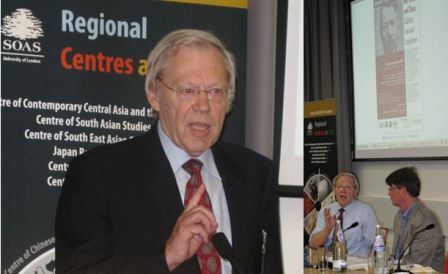 Thanks went to: Professor Stephan Feuchtwang, founding Director of the China in Comparative Perspective Network (CCPN) and Editor-in-chief of JCCP when they were both at LSE. 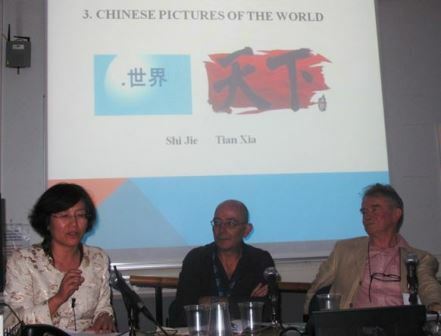 Both CCPN Global’s and JCCP’s involvement in the Weber and China conference have benefitted greatly from Stephan’s input; Professor Elisabeth Croll, for her arranging Xiangqn Chang to be a Research Associate at SOAS’s Centre of Chinese Studies in 2006, without that link we would not have been able to hold the conference at SOAS; Professor Martin Albrow, for proposing to co-host the Weber and China conference when he acted as the Principal Research Associate of CCPN at LSE (2011-13) and led the conference’s Programme Committee which organised the conference successfully; SOAS’s colleagues: Dr Tian Yuan Tan, the current Director of the Centre for Chinese Studies, Professor Michel Hockx, the Founding Director of the new SOAS China Institute, Professor Julia Strauss, Dr Hong Bo, Mr Ernest Caldwell, Professor Paul Webley, Professor Stephen Chan, Dr Andrea Janku, Dr Peter Flügel, Dr Carol Tan, and Ms Jane Savory, the Manger of SOAS’s Centres and Programme Office, for their support in different ways throughout the conference. Other Conference Programme Committee (apart from the above mentioned): Professor John Breuilly and Dr Kent Deng of LSE who were a part of the inception of the conference, Professor Sam Whimster, Editor of Max Weber Studies, Dr Carlos Frade, Chair of Weber Study Group, BSA, Dr Athena Leoussi, Co-Director of European Studies Programme of University of Reading, for their intellectual input and emotional support; Other organisers and sponsors: Professor Letian Zhang, of Fudan University, the Co-director of CCPN Global, Professor Daming Zhou of Sun Yet-sen University and the Guest Editor of JCCP, and Mr Michael Sheringham, who runs the Arthur Probsthain Bookshop, for their organization and sponsorship of the conference, for their organizational and financial support; and all the volunteers: Mimi Ajibade, Anlan Chen, Wewei Chen, Mieke Houvenaghel, Farwa Sial, Ghayda Nawres from SOAS, and Xiaojing Sun from CCPN Global and Bristol University, for all their help during the conference. Xiangqun then expressed her gratitude with the Chinese phrase that ‘when everybody adds fuel, the flames rise high’ (众人拾柴火焰高) to all the conference participants including keynote speakers, panelists of the closing session, plenary speakers, all the panel speakers and participants for their enthusiasm and energy to make this conference so intellectually productive. 最后一位演讲人是美国华盛顿大学国际关系学院副院长、社会学系韩格理Gary Hamilton教授（左下图）。沃尔夫冈•施鲁赫特教授（右 下 图）主持了演讲。他承认从韩格理的韦伯研究中学到了两件事：第一，韩格理基于亚洲的资本主义的家庭研究让他认识到，韦伯坚持资本主义要求把家庭和公司分开 的观点不适用于亚洲。第二，他同意韩格理的观点，认为韦伯在基于“孝”和“父权”而进行的传统中国和古罗马社会的比较中出现了错误。施鲁赫特在提到这一点 时展示了去年出版的费孝通《乡土中国》中英对照版，英译本由韩格理和王政（下一组照片右二）翻译。中英文对照版《乡土中国》的编辑曾在2010年费孝通教 授百年诞辰纪念时主持了一个韩格理教授和常向群博士之间的对话，讨论费孝通对世界人类学和全球社会学的贡献。对话的缩节版发表在英国皇家人类学会会刊 Anthropology Today 的2011年第6期（左边第一、二张照片），对话完整版见2011年第1卷第2期《中国比较研究》。 韩格理在演讲中展示了池塘中的单一的纹波和多个波纹的图片来解说“差序格局”中的关系的不同模式，并指出每个人都是自己关系圈的中心。韩格理曾在一个更大 的 框架中用费孝通的“差序格局”和“团体格局”纠正了韦伯的“孝”和“父权”观点，这篇早期论文发表在《中国比较研究》（JCCP）的创刊号上（2011年 6月第1期）上。《中国比较研究》创刊号（右图）的主要文章都和费孝通的《乡土中国——中国社会的基础》相 关（副标题为费孝通和韩格理讨论英文版书名时一起加上去的）。这本书中文版发表于1947年，英文版1992年。但它至今仍然有价值，因为后来的中国学者 许多重要著作都是建立在此基础上的；而且甚至连本书的译者韩格理本人，都忽略或没有充分理解费孝通在这本书中提出的许多重要观点（常向 群，2011,1(1):32，JCCP）。费孝通《乡土中国》发表15年后，王斯福(Stephan Feuchtwang)才认真地阅读了此书，写了“社会的利己主义和个人主义：一位西方汉学人类学家的惊喜和问题——阅读费孝通教授的中西对比 ”一文，这篇对“差序格局”较为深入研究的论文的中英文版，同时再现于《中国比较研究》2011年第1卷第2期。（注意：该期刊封底的网址和邮箱地址分别 从2013年3月和7月停用。目前电子邮件是：journal@ccpn-global.org；网站：www.journal.ccpn-global.org).